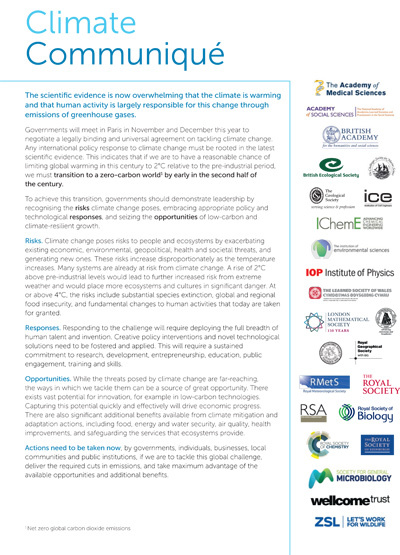 The IES is proud to be of twenty four signatories on a communiqué which has been prepared by some of the UK's foremost academic and professional institutions, calling on national governments to act now to deal with the serious risks posed by climate change. This communiqué, published today, brings together a diverse range of organisations from across the sciences, social sciences, arts, humanities, medicine and engineering for the first time. In this statement, these institutions say that to tackle climate change, governments, including that of the UK, must seize the opportunity at climate talks in Paris in December to negotiate an agreement based on the latest scientific evidence. The full communiqué can be downloaded (pdf), by clicking on the image below.